6 What is the difference between AxisManagerRepresentation and AxisManagerConfiguration? 11 How many case should be managed to add/insert/paste (rows) axis in a table ? The Papyrus Table uses the NatTable widget. Its documentation is available here and here. This kind of table is available since the Papyrus Release 0.10 in June 2013. The NatTable source code can be downloaded with git (http://git.eclipse.org/gitroot/nattable/org.eclipse.nebula.widgets.nattable.git). 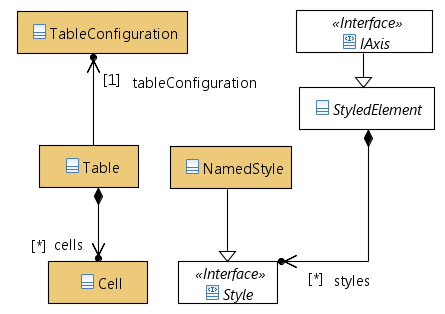 Papyrus provides tables to edit features of UML Elements. In general, UML Elements are displayed in rows and their features are displayed in columns. These tables can be flat or hierarchical, and they can be filled by the user or synchronized with the context of the table. The Papyrus integration should allow creating a Matrix, but Papyrus does not provide Matrix editors yet. Named object to store information. Implementations of this element allow you to store boolean, int, list, string, etc. It works is the same way than in the GMF notation metamodel used by the Papyrus Diagram. Abstract element that allows to reference style NamedStyle. Each element provided by the table metamodel must inherit from this one, so developers can add easily information to element, without modifying the table metamodel. Element that contains all the information required to create a table. The user can't modify it. Element that is created from a TableConfiguration. Users can modify it using the tabular editor. It always references a TableConfiguration. Abstract object used to reference elements represented by columns and rows. In order to make easily the creation, destruction and search for table editors, Papyrus provides helpers to to that (since Papyrus 1.2/Eclispe Neon). tableDescription (String: the description of the created table. return a IStatus. the code of the IStatus indicates if the table can be created or not and why. 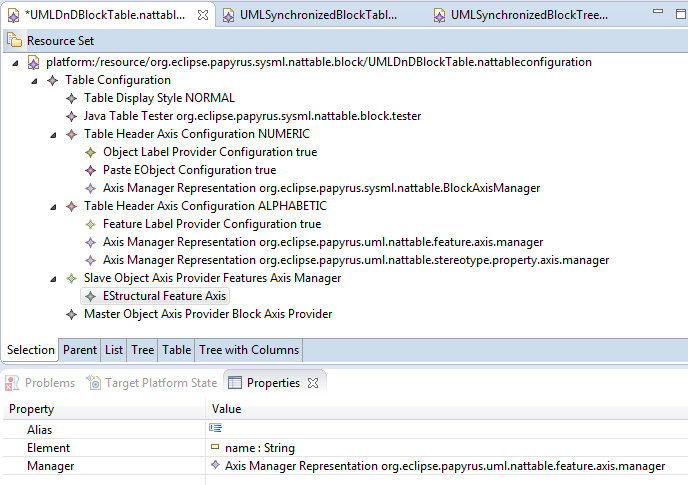 Possible code are defined in the class org.eclipse.papyrus.infra.nattable.common.api.ITableEditorStatusCode. all setter method for contructor parameters. These values are checked by each call to the previous method calling canCreateTable(). The class org.eclipse.papyrus.infra.nattable.common.api.TableEditorDeleteHelper.TableEditorDeleteHelper(Table) allows you to create a table editor easily. tableToDestroy (Table): the table to destroy. all setter method for contructor parameters. These values are checked by each call to the previous method calling canDeleteTableEditor(). The facilities described previously are tested by the plugin org.eclipse.papyrus.infra.nattable.common.tests. The Sample Reflective Model Editor, provided by EMF. Often, we don't have enough information in the Property View to edit reference, because the label doesn’t us give enough information to distinguish element. In the following tutorial you will need to create several instances of the same object. The only way to be sure of referencing the right one is to open the file with the text editor. so you should think about checking the file in a Text Editor. 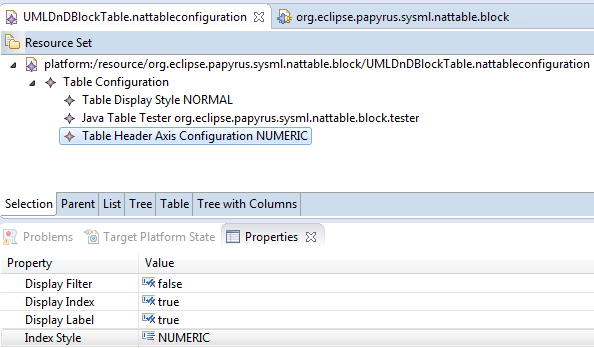 For this step, first of all, you must to create a new Eclipse Plugin Project, called org.eclipse.papyrus.sysml.nattable.block for this example. In this one, you have to create a new Nattableconfiguration Model file. One way to create these files is to use a creation wizard. Select from the Eclipse menu: "File" > "New" > "Other..."
Select "Example EMF Model Creation Wizards" and "Nattableconfiguration Model". Click "Next". Select your empty plugin "org.eclipse.papyrus.sysml.nattable.block" and write the name of the file that contains your new model. The file should must have the extension "nattableconfiguration" (e.g., you can write "UMLDnDBlockTable.nattableconfiguration"). Click "Finish". You must declare a Table Display Style as child of the Table Configuration. UMLSynchronizedBlockTable and UMLDnDBlockTable : they are Flat Table, so the value must be NORMAL (if no display style is defined, the configuration will be interpreted than a NORMAL table. Step1: You must declare a Java Table Tester as as child of the Table Configuration to filter the allowed context to create a table. Note: Since the implementation of the viewpoint, the tester is not yet called, but it could be better to continue to provide it! Click with the right mouse button on the Table Configuration item and create a New Child of type Java Table Tester. id : this is a string identifying your java tester. 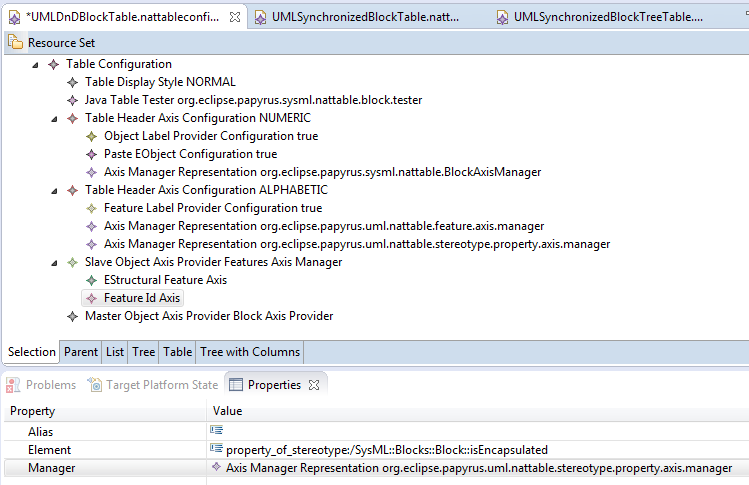 Here, we decided to call it org.eclipse.papyrus.sysml.nattable.block.tester. Do these two first steps for each table that we are creating: UMLDnDBlockTable, UMLSynchronizedBlockTable and UMLSynchronizedBlockTreeTable. 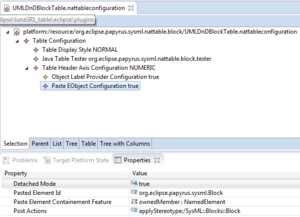 Step3: Create a java class named BlockTableTester implementing org.eclipse.papyrus.infra.nattable.tester.ITableTester. If you have an 'unresolvable reference' error, add 'org.eclipse.papyrus.infra.nattable' to the list of required JARs and class folders in the Java build path or your plugin. * Copyright (c) 2013 CEA LIST. Step4: Register this class in the file plugin.xml of your plugin project. id : the same id than you declared for the Java table Tester in the nattableconfiguration field. Display Filter : value ignored for rows. Display Index : the Row Index Header will be hidden if false. Display Label : the Row Label Header will be hidden if false. Index Style : ALPHABETIC or NUMERIC. We often use Numeric for Rows (and Alphabetic for Columns). This object provides the configuration used to display Row Label in the Row Header Label Area. As the rows represent edited object, we will use an Object Label Provider Configuration. This is in this part than we will configure the paste and the synchronization of our tables. 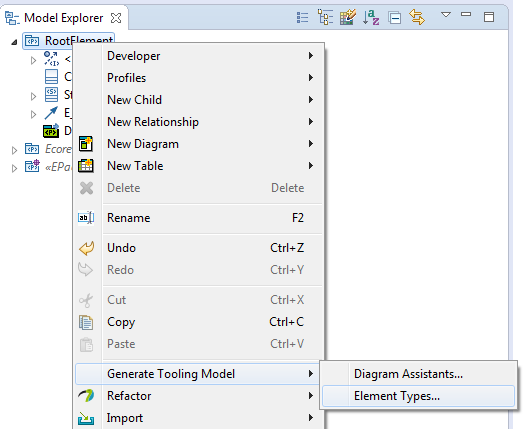 These strings representing the element to paste do not come from the Eclipse UML2 Project. They are provided by Papyrus and used by the Papyrus Service Type. If you create your static profile, you can generate them and use them here. The generation of these elements is described in an other documentation page (TODO (not yet done)). Select Generating Tool Model, then Element Type..., a dialog will be opened, press OK. A new file called model.elementtypesconfigurations has been created in your project. You should register this file in your plugin.xml file, using the extension point org.eclipse.papyrus.infra.elementtypesconfigurations.elementTypeSetConfiguration. if detached mode=true, a post action is required to apply the stereotype Block on the created elements. Set the value to applyStereotype:/SysML::Blocks::Block to apply it. It will be used only if your table is filled by DnD by the User. So you need to complete the Table Header Axis Configuration in your file UMLSynchronizedBlockTreeTable.nattableconfiguration. You must create a new Paste Eobject Configuration for each category listen by the table. The configuration previously created to paste Block could be reused (but you can also duplicate it in your file), so you need to create 2 others Paste Eobject Configuration. There is nothing to do, it is not a synchronized table. The Tree table listen several features (at least one be depth). Here, we call these features categories. Step1: Firstly, you need to declare an additional label configuration to know how to display the categories in the table. Often, we create a Feature Label Configuration. If required, you could create an Object Label Configuration instead, but you get less possibilities of configuration (only Display Label, restricited to the name of the object, and Display Icon) instead of the 6 degrees described below. This Feature Label Configuration will be referenced by all Tree Filling Configuration created in the next steps. Step2: Now you need to create 3 Tree Filling Configuration, one by categories. So you need to create one with depth=0, one with depth=1 and one with depth=2. Label provider : references a Label Provider Configuration declared as children of Row Header Axis Configuration. This label provider will be used to display the categories. Here, you must reference the Feature Label Provider Configuration that you came to define in the previous step. Step3: Now you need to define the category (the feature) which is listen by each of these Tree Filling Configurations. You must create an IAxis as child of each configuration. For this example, the IAxis must be an EStructural Feature Axis. 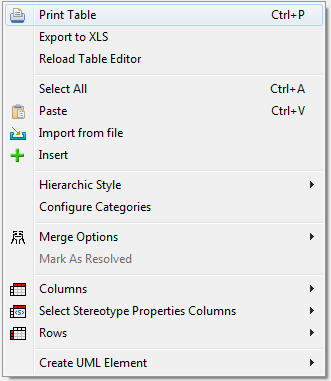 Header Label Configuration : the label configuration to use in the Row header Label area. Specific Axis Configuration : Here, you should references all the Tree Filling Configuration previously created. Paste EObject Configuration are required too in only one usecase: if your Tree Table is filled by the user (DnD) (so you do not have Tree Filling Configuration on depth==0), you should reference the Paste EObject Configuration to use to create root elements. In others cases, it is not mandatory, because the Paste EObject Configuration are already referenced by the the Tree Filling Configuration. Now, you need to create a java class called for example BlockAxisManager. This axis manager must implement org.eclipse.papyrus.infra.nattable.manager.axis.IAxisManager, but we advice you to extends org.eclipse.papyrus.uml.nattable.manager.axis.UMLElementAxisManager. Then you should register this class in your plugin.xml file using the extension point : org.eclipse.papyrus.infra.nattable.axismanager. Specific Axis Configuration: You must reference your EStructural Feature value Configuration and your Paste EObject Configuration. org.eclipse.emf.transaction;bundle-version="1.9.0", org.eclipse.nebula.widgets.nattable.core;bundle-version="1.3.0", org.eclipse.papyrus.infra.emf.nattable;bundle-version="1.1.3", org.eclipse.papyrus.infra.nattable;bundle-version="1.1.3", org.eclipse.papyrus.infra.nattable.model;bundle-version="1.1.3", org.eclipse.papyrus.infra.widgets;bundle-version="1.1.3", org.eclipse.papyrus.uml.nattable;bundle-version="1.1.3", ca.odell.glazedlists;bundle-version="1.9.0"
Now, you can create a java class, called for example BlockSynchronizedAxisManager. This axis manager must implement org.eclipse.papyrus.infra.nattable.manager.axis.IAxisManager, but we advice you to extends org.eclipse.papyrus.uml.nattable.manager.axis.AbstractStereotypedElementUMLSynchronizedOnFeatureAxisManager<T_StereotypeApplication>. Specific Axis Configuration : you must reference your Paste EObject Configuration allowing to paste Block and all your Tree Filling Configuration. id : org.eclipse.papyrus.sysml.nattable.BlockTreeAxisManager . It must be the same id than in the Axis Manager Representation. This step is the same to build the 3 tables : UMLDnDBlockTable, UMLSynchronizedBlockTable and UMLSynchronizedBlockTreeTable. Display Filter : if true a row filter will be displayed at the bottom of the Column Header Area. Display Index : the Column Index Header will be hidden if false. Display Label : the Column Label Header will be hidden if false. 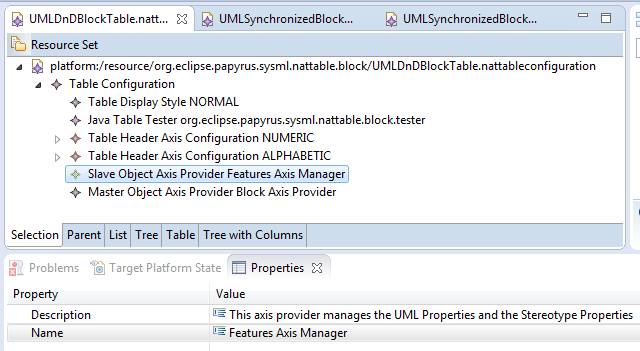 Axis Manager Id: org.eclipse.papyrus.uml.nattable.feature.axis.manager. It is an axis manager already declared in Papyrus. 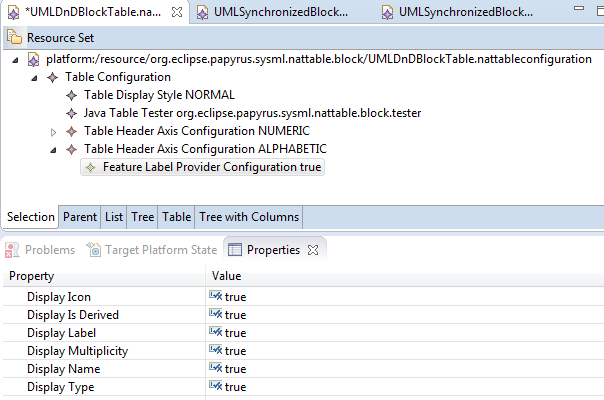 Warning in UMLSynchronizedBlockTreeTable, there are now two Feature Label Configuration, Select the right one. 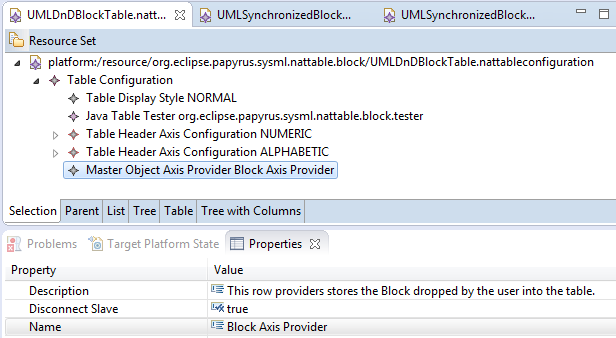 Axis Manager Id: org.eclipse.papyrus.uml.nattable.stereotype.property.axis.manager. It is an axis manager already declared in Papyrus. Disconnect Slave : we advice to set it to true. false for each added row, the system will add columns axis for each features of the rows not yet represented by a column axis. Now you should declare here the default columns for your table. Alias : this field allows to define an alias for the represented feature. COLUMN : all cells of the columns will use the same kind of editors (used here, because we have the feature in column, so the system needs to declare a Cell Editor by column. it is the default, because you could declare several axis provider for columns! it is the default, because you could declare several axis provider for rows! Icon path : an icon (16x16) used to represent this kind of table. Description : This table allows to show and edit all Block owned by a Package. It is a tree synchronized Table. It allows to show the Block, with their Operations and them Parameters. 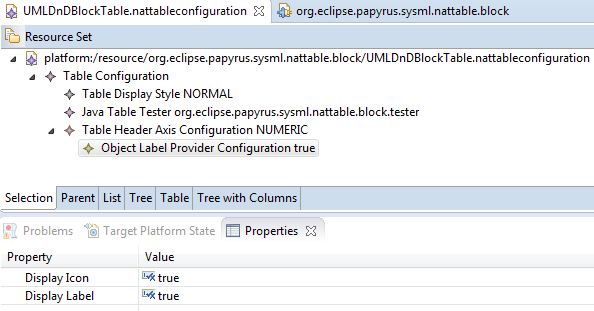 Each Table Configuration File created previously must contribute to the Papyrus Extension Point org.eclipse.papyrus.infra.nattable.configuration. This extension point allows to contribute to the Table Configuration Catalogue provided by the Papyrus Framework. type: the type of the table, it must be the same string than the type field in the nattableconfiguration file. Please, see Viewpoint documentation embedded in Eclipse. This part is the same for the 3 kind of tables previously created. Here we choose to explain the viewpoint configuration for the UMLDnDBlockTable table. You should adapt this documentation to your usecase. For this step, first of all, you have to create a new Viewpoints configuration in your plugin. Create the file UMLDnDBlockTableViewpoint.configuration. Using this way, you will able to contribute to the default Papyrus Viewpoint. Create a new child, Papyrus ViewPoint, set it its name : Default Papyrus Viewpoint. You should not use an other name, because this name is used as id to contribute to an existing viewpoint (the Papyrus Default Viewpoint). We don't edit others fields. Categories: the category of your contribution (UML, SysML, Profile, ...) It allows you to define in which context your contribution must be proposed in the creation menu. Categories: the category of your contribution (UML, SysML, Profile, ...) It allows you to define in which context your contribution must be proposed in the creation menu. Here, we set SysML. Now you can add Model Rule and Owning Rule as children of your Viewpoint. These properties define the allowed context of the table and its possible owner. The first one is the context used to create new items in the table, and the second to set the items below which we can view the table in the ModelExplorer. The multiplicities indicates how many table of this kind can references the root and the owner. We decide than only package can be displayed as parent of the table in the ModelExplorer. Once you have finish to edit the configuration, you must register it using the extension point org.eclipse.papyrus.infra.viewpoints.policy.custom. Select your stakeholder and edit its field Viewpoints to reference the viewpoint created in the previous step. From here, you can continue the edition of the configuration, as described previously for the contribution to the Default Papyrus Viewpoint Configuration. The second way with viewpoint using Papyrus Table element In this case you must fill the field configuration with the path of your table configuration file. org.eclipse.papyrus.infra.nattable.full.labelprovider : the context to use to find the label provider used in the table. This one calls the others label providers according to the region for which we are looking for the text/image to display. These contexts are declared into the plugin org.eclipse.papyrus.infra.nattable. All label provider declared on these context must accept elements implementing ILabelProviderCellContextElement. This object encapsulate the cell for which we want display a text AND useful elements which can be used to define the text/image/color/... to display in the cell. In these changes, IRevealSemanticElement and its associated method revealSemanticElement is at the core of the modifications. where we implement the interface and add the call for the newly created revealSemanticElement method in AbstractNattableWidgetManager and giving it the list of selected objects. the method goes through the lines and columns of the tables to find all the elements contained in the list and then proceed to select them graphically in the table. in the original method the selection only allowed the first selected element found to show. we now collect all found IGraphicalEditParts and proceed to set the selection in the graphicalViewer. in the handleSelectionChangedFromDiagramEditor method the principal problem was that, if revealSemanticElement was called, it shunned the model explorer as it was not an IEditPart and the redundacy of the IAdaptable verification crashed the process. when we are in an IIeditorPart, as we were interested in the Eobject for the contruction of the list of selected elements and that org.eclipse.papyrus.infra.emf.utils.EMFHelper.getEObject(Object source) already checked for the IAdaptability, the direct replacement of the verification was done. as for the selection in the model explorer, we went through org.eclipse.ui.navigator.LinkHelperService.getLinkHelpersFor(Object anObject) to get the list of LinkHelpers and used the LinkHelper in org.eclipse.papyrus.views.modelexplorer.LinkHelper.activateEditor(IWorkbenchPage aPage, IStructuredSelection aSelection) to handle the selection with revealSemantiElement. Three listeners have been added to the AbstractNattableWidgetManager class in order to capture the graphical changes and edit the model. Those methods verify the model in order to know if the graphical values are already present and if not create them and write them using a CompositeCommand and executing it. The major change introduced in order to accomplish this is the modification of the table's model by adding new Styles, more particularly intValueStyles that are used to carry this specific information. These styles are introduced in the Axis elements, if the changes of size modify axis, or to a newly, or existing, LocalHeaderAxisConfiguration if the changes modify headers. Of course, both of them are now StyledElements and therefore can call on the method getNamedStyle(). Two init methods will also be called when refreshing or opening the table in order to show the modified table. Both have a default behavior, in case no styles were attached to an element, to apply its default size to its graphical representation. The merge is based on nebula's AutomaticSpanningDataProvider (org.eclipse.nebula.widgets.nattable.data.AutomaticSpanningDataProvider) allowing us to apply a spanProvider to the table's BodyLayerStack and, with minor modification of the method valuesNotEqual(), triggering the desired span (i.e. merge) throughout the layer. It is to be noted that the cells are merged using their values and not their types. To accomplish this four new merge handlers were created, piloted by a menu constituted of exclusive choices. The handlers' model modification behavior are similar to the resize listeners' one, where the style's value is researched in the model and created, or modified, depending on the case, set inside a CompositeCommand and executed inside the core AbstractMergeHandler. The merge boolean will then be carried by the LocalHeaderAxisConfiguration if the user chose to merge all the columns/rows inside the table or by the Axis if the user chose to merge only selected Axis. To access these handlers, new extensions have been added in the form of a new menu to call on the handlers and a property tester to check the availability of the menu's options or not depending on the merge state of the table; and to update the toggles of each menu, new updateToggleCommandState() have also been added to NattableModelManager, calling on the getToggleState[...]() methods in AbstractNattableManager. One init method and two Listeners, one for the resourceSet and another for the Layer, are used to update the graphical view throughout the changes. A PapyrusSpanningDataLayer has been added and @Overrides the setDataValue of nebula's org.eclipse.nebula.widgets.nattable.layer.SpanningDataLayer#setDataValue(int, int, java.lang.Object) to allow the edition of multiple cells inside a merged selection. The edition will then verify if the value to be inputted can indeed be, see org.eclipse.papyrus.infra.nattable.manager.cell.AbstractCellManager.setValue(), and edit the cell accordingly. Of course, the merge selection is updated after this so that, inside a previuosly merged selection, only the cells of equal values are still merged. We decided to introduce a difference between the Axis Manager used in the Table. There is Slave and Master. For the tables which present an axis with Object (Rows) and an Axis with Features (Columns), like in UML Generic Table, the row axis provider is a Master and the Column axis provider is the slave. Its means that the the column axis manager provides elements which depends on the elements provided by the rows axis. For UML Table, the columns axis provides the features for the object displayed as rows in the table. As you can declare several AxisManagers for rows and several AxisManager for columns, we store them in CompositeAxisManager. So you must have a CompositeAxisManager Master for rows and a CompositeAxisManager slave for columns. You can mix Master and Slave Axis Manager in a CompositeAxisManager. In case of Matrix, the Rows and the Columns Axis Manager must be master, because the twice provide Object. What is the difference between AxisManagerRepresentation and AxisManagerConfiguration? specificAxisConfiguration:IAxisConfiguration the configuration to apply to the axis (synchronization, paste configuration, ...). complete for configurations which do not exist in the AxisManagerRepresentation#specificAxisConfiguration. The filters are located at the bottom of the Column Header. In Papyrus, you can get cells displaying N/A, it means than the columns is not available for the row element owning this cell. That's why declaring your own filter, you must think to manage this specific value. Moreover, if you declare a specific comparator in your filter configuration, it should returns the value org.eclipse.papyrus.infra.nattable.filter.FilterPreferences.INCONSISTENT_VALUE when the value in the cell is inconsistent vs the filter value. This specific returns will be used, according to the preference obtained with org.eclipse.papyrus.infra.nattable.filter.FilterPreferences.displayInconsistentValueWithFilter(Table) to show/hide the rows with inconsistent values. 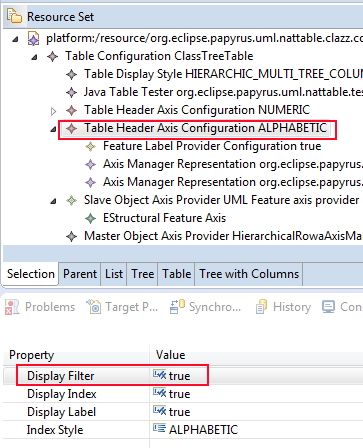 To activate filter by default for your table, in your nattableconfiguration file, you must select your Table Header Axis Configuration used for columns and set the value Display Filter to true. order : the order to use for your configuration (smaller are more priority). Papyrus default configuration uses value near to 8000.
public boolean handles(IConfigRegistry registry, final Object axis): Your must return true if your configuration must be applied to the axis. public void configureFilter(IConfigRegistry configRegistry, final Object axis, final String configLabel) here, you will configure nattable to use your filter configuration. public String getConfigurationId(): You must return a unique id. public String getConfigurationDescription(): You should return a description of your configuration. It will be use in user dialog to allow to the user to apply a specific configuration for a column. to declare the class which will save the filter state in the model and which will read/convert the saved value to the value to use. * Copyright (c) 2015 CEA LIST and others. You can see that we store their name in the model and a direct reference to its in the model. numeric mode: This mode allows you to use comparison operators : <, >, <=, >=, = and <> for not equals. If you need to declare your own comparator and you extend org.eclipse.papyrus.infra.nattable.filter.configuration.TextEditorFilterConfiguration.configureFilter(IConfigRegistry, Object, String), you should know these points. Your comparator must always manage String comparison to manage cells with N/A value. In the case where the value to compare is inconsistent (String value to match a numerical value for example), Your comparator must returns the value org.eclipse.papyrus.infra.nattable.filter.FilterPreferences.INCONSISTENT_VALUE. this value will be interpreted as an impossible comparison. The method org.eclipse.papyrus.infra.nattable.filter.FilterPreferences.displayInconsistentValueWithFilter(Table) allow to know it the inconsistent row (impossible comparison) must be displayed or hidden. By default, Papyrus hides these rows. This editor allows to edit/create ValueSpecification using a text field. The plugin org.eclipse.papyrus.uml.textual.editors.example provide an example of integration in the table. Taking this plugin into your workspace will allow you to edit the column defaultValue using this editor. This editor allows to edit references to named element. 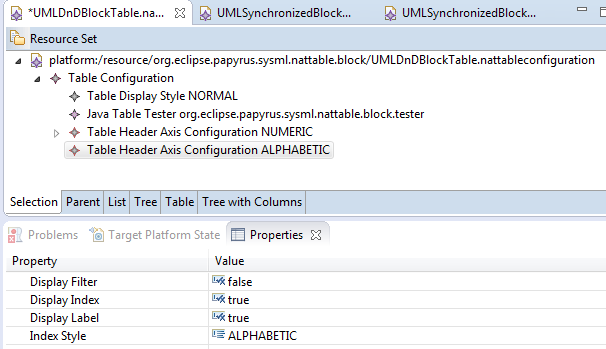 The plugin org.eclipse.papyrus.uml.textual.editors.example provides an example of integration in the table. Taking this plugin into your workspace will allow you to edit the precondition of an operation using a text field. The class of this cell editor is org.eclipse.papyrus.uml.nattable.manager.cell.editor.UMLReferenceTextWithCompletionCellEditor. The only way to restrict your cell editor to a kind of table is your implementation of the method ICellAxisConfiguration#handles(Table table, Object axisElement). There is not yet a way to force the usage of given cell editor in a nattable configuration file. 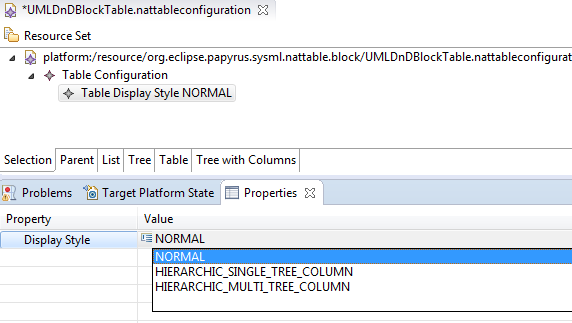 The selection in table is managed by the org.eclipse.papyrus.infra.nattable.provider.TableSelectionProvider which manages the selection layer. This table selection provider manage the control and the shift mask and is managed by CellSelectionEvent, RowSelectionEvent or ColumnSelectionEvent. The getSelection() managed in the NattableModelManager returns a TableStructuredSelection. This one contains a reference to the wrapper for the table selection: TableSelectionWrapper. To get this one: it is just needed to use the getAdapter(TableSelectionWrapper.class). The TableSelectionWrapper can allow to determinate the selected cells, the selected rows and the selected columns. The rows and the columns selected only contains the entire rows or columns selected, not partial. This can determinate if the cells, rows or columns are continous or not. NamedStyles are properties that the users can add to table configurations to provide values to tables. For example, "expandAll" is a BooleanValueStyle (i.e., a boolean NamedStyle) that expands all the rows in a tree table when its value is 'true'. How many case should be managed to add/insert/paste (rows) axis in a table ? The feature must be editable (not read-only). Moreover it will be better if the listen feature is not filtered (java class, queries (not yet implemented the 20th October 2015),...). Synchronized flat tables (id. Requirement and Allocation table) : The displayed rows are synchronized with the UML Model listening a feature. There is no IAxis wrapping the displayed rows. To Add/insert/paste rows you should edit the UML Model. The table will be updated. The order is given by the synchronization with the feature (java class of the AxisManager could changed it, but not the user and not the developper writing a add/insert/paste feature). Tree Table : to add/insert/paste new rows in this kind of table you only should edit the UML model. Like for Synchronized flat table, the order is given by the synchronization with the feature (java class of the AxisManager could changed it, but not the user and not the developper writing a add/insert/paste feature). Excepted in one case where you must managed yourself the order : when the tree table has no TreeFillingConfiguration on depth 0, so when the root of the table are filled by the user using drag and Drop. edit all existing table configurations in order to take in account the new axis manager (if required). static (the axis provided by our axis manager are provided by the table configuration or a user choice. It exists several possible combination of feature : flat/tree*synchronized/not synchronized*EObject/EstructuralFeature. We not yet implements all the possible cases, so here we will describe the more relevant ones. In all cases, your class must implements org.eclipse.papyrus.infra.nattable.manager.axis.IAxisManager. Each Axis has a way to reference the managed object. We advice you to extend org.eclipse.papyrus.infra.emf.nattable.manager.axis.EObjectAxisManager. The Eobject axis element is wrapped in a EObjectAxis. We advice you to extends org.eclipse.papyrus.infra.emf.nattable.manager.axis.AbstractSynchronizedOnEStructuralFeatureAxisManager. The EObject axis element is directly managed by the axis manager and not wrapped in a EObjectAxis. We advice you to extend org.eclipse.papyrus.infra.emf.nattable.manager.axis.EStructuralFeatureAxisManager. We advice you to extend org.eclipse.papyrus.uml.nattable.manager.axis.UMLStereotypePropertyAxisManager. The stereotype properties are referenced in a FeatureIdAxis, using a string, starting by the string : properties_of_stereotype:/ and suffixed with the qualified name of the property of stereotype. We advice you to extends AbstractAxisManager. The best way to reference your object which is not a EObject, is to use an IdAxis to reference it using a string. Header Label Configuration: you must reference the Label Provider Configuration created previously. It will allow you to get the contents of the cell and to save it after editing value. Create a new java class implementing org.eclipse.papyrus.infra.nattable.manager.cell.IUnsetValueCellManager or extending org.eclipse.papyrus.infra.nattable.manager.cell.AbstractCellManager or one of these subclasses and complete it. Register this class in the plugin.xml file, using the extension point org.eclipse.papyrus.infra.nattable.cellmanager. It will allow you to edit the cell value. Create a new class implementing org.eclipse.papyrus.infra.nattable.celleditor.config.ICellAxisConfiguration or one of these subclasses and complete it. It will allow you to display the contents of the cells returned by the CellManager. This steps is not mandatory, because it depends on the object displayed in our cells. Maybe your case is always managed by Papyrus, maybe not. Create a new class extending org.eclipse.papyrus.infra.nattable.provider.AbstractNattableCellLabelProvider or one of these subclasses and complete it. This step is not mandatory, by default, the string filter will be used. Create a new class, implementing org.eclipse.papyrus.infra.nattable.filter.configuration.IFilterConfiguration or extending org.eclipse.papyrus.infra.nattable.filter.configuration.AbstractFilterConfiguration or one of these subclasses. You can call the Eclipse Menu Service to fill your own MenuManager with contributions declared with the eclipse extension point org.eclipse.ui.menus. Here it is a code example for the Papyrus Table. (The final implementation doesn't use the IMenuService in the table, because it is already done upper in Papyrus Infra Core). In your plugin.xml file, you should add a new extension org.eclipse.ui.menus, with a new menu contribution. The field locationURI must be set to popup:org.eclipse.papyrus.infra.nattable.widget.menu, in order to be able to contribute to the table body menu. These separators are declared in the file org.eclipse.papyrus.infra.nattable.menu.MenuConstants. In your plugin.xml file, you should add a new extension org.eclipse.ui.menus, with a new menu contribution. The field locationURI must be set to popup:org.eclipse.ui.popup.any and the field allPopups should be set to true. In the visibleWhen condition, you must create a with child working on the Eclipse variable selection. In with condition, you must create a child test, working on the property "org.eclipse.papyrus.infra.nattable.tester.isNattableWidget and comparing the result value to true. You should force the Plugin activation too. We assume than you know how to declare a menu for all tables in Eclipse. We take as example the PropertyTester used for Papyrus Table Menu. 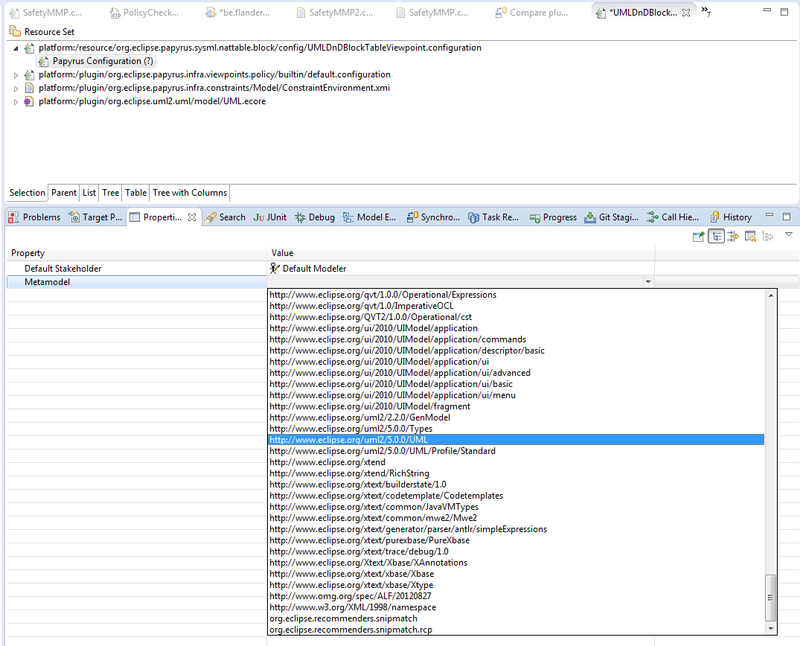 The PropertyTester can be used to define action visibility in the menu, handler enablement, handler activation, ... Your property tester can be used each time you wrote expressions in a plugin.xml file. id: the id of your tester. It must be unique and it will be used to declare the condition of activation of your action in the menu. properties: the list of properties provided by your tester. Properties are strings, separated with comma. properties="isNattableWidget, hasFeatureRowHeaderConfiguration, hasFeatureColumnHeaderConfiguration, hasSlaveRowAxisProvider, hasSlaveColumnAxisProvider, canInvertAxis, isHierarchicTable"
* Copyright (c) 2012 CEA LIST. To use it, please read the example of the documentation Table Developer Documentation/Body Menu (Papyrus1.1/Eclipse Mars). Developper can add their own commands to the row and column header region. The menu displayed on these regions is created dynamically, using the category of the command. To add a command in the row header menu, declaring your own command using the extension point org.eclipse.ui.commands, you should fill the field categoryId, with the string org.eclipse.papyrus.infra.nattable.rows.command.category. Of course, you should provide a java handler for your commands using the extension point mechanism. to conclude, don't forget to implements required methods to allow (or forbid) all features already supported by the table framework. The list of the supported feature is available here. it allows to define the initial configuration of the table for the rows and the columns. it provides the configuration to use to get the axis displayed as rows or as columns with the field ownedAxisConfigurations. This object looks like the previous one, but it is used in the Table. It is its equivalent at 'runtime'. the table will use percentage sizing for the columns display, excepted if you set a BooleanNamedStyle columnsWidthAsPercentage to false has a child of your TableConfiguration. org.eclipse.papyrus.uml.properties.widgets.NattablePropertyEditor.createTableURI(EObject, TableConfiguration) for further information. So during your table development, you need to clear your workspace each time to test your table configuration, or you need to remove your table instance from the location yourRuntimeWorkspace/.metadata.plugins/org.eclipse.papyrus.uml.properties/tables. This page was last modified 07:53, 31 May 2017 by vincent.lorenzo . Based on work by Nicolas FAUVERGUE, Nicolas FAUVERGUE and Mickaël ADAM and others.